We are currently testing a first prototype (see photo): the stove is built by using an 'assembly kit' consisting of 6 donut-shaped insulative bricks protected with two ceramic pipes. the ceramic plate including the potrests comes on top. the whole unit is finished with cement plaster, as the tea company wants something longer lasting, clean, and hygienic with an easy-to-clean surface, low-maintenance etc. The pre-fabricated parts are there to maintain standard dimensions which are highly endangered once you build the structure entirely from scratch on your own. Design-drift is pre-determined otherwise. I am now thinking of going the Crispin-route concerning the shelf-solution, similarly to the 'good stove'. Only that I still very much believe in one-fire-per-pot, especially in an african setup where I have seen too many stoves with only one pot in use and the other pot-hole uncovered, drawing the heat away (especially if you don't have potrests under the first pot. Or even better, putting the pot on the second pot-hole and leaving the first one uncovered, wonderful logic you come across in the real life out there. People just don't behave like stove designers think they should do. So I would substitute the metal shelf by a brick firewood rest and a lateral air-intake (can't do it the Crispin original-way, as otherwise the stove would be too inconvenient to use if you have an opening at the back. Or it would take up too much space in the kitchen if you have a lateral firebox opening and a lateral air-take). Next Tuesday I am going build another two prototypes at the tea estates: both 'Crispin-layouts' with out shelf, one with insulation and one without insulation. 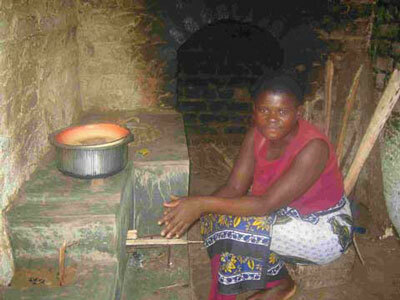 we have got an intern here for 3 months to do some comparative stove testing. they will all have ceramic-plate-potrests, but no skirt. we are still hunting for an adjustable skirt (maybe a metal ring with two clamps so that you can adjust the size around the pot). We will let you know once we are there. We are trying to go the route of a more comprehensive kitchen design by also looking into the ventilation slots for smoke removal (even a rocket stove smokes in the first minutes or when the firewood is not dry), adding a fireless cooker as an inbuilt feature (to remind people constantly about it, if it is a mobile unit, they tend to forget or the basket is used for other purposes). The latest addition is the small sand-box for the firewood, so that once you are done with the cooking you stick the firewood in there and extinguish it without making it wet. and it is ready at hand when you light the fire the next day. One thing that comes to mind is the 'Rocket shelf" and the wood stand that are metal parts and are required with the standard design. Saibhaskar Nakka has made an interesting change to the basic Lion Stove layout using a side feed for the air and an open hole to feed in the wood, and leaving out the preheating. This could be done with the staff house stove. Where there is now a closed side to the combustion chamber, open a channel at the level of the bottom of the combustion chamber to allow air to enter sideways, rather than under the fuel. This will partly offset the tendency of the flames to run up the back wall. The metal parts can then be eliminated saving a $ or two. There is then no need to have a T-shaped 'elbow' hole with a metal shelf. Brick up the lower portion that allowed the air to go under the fuel. You will have an opening for the wood only. Then, build a clay or brick shelf pointing away from the stove that will act as a wood support as the air no longer needs to go under the fuel so there is no longer a need for a metal wood support. 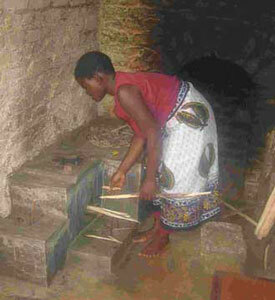 The whole stove is then clay or mud/brick, the flame against the back wall is partly addressed by the side feed of the air, and the 'shelf' is just a support for the fuel that extends into the room a convenient distance. When feeding in wood, it is more like placing it on the floor than balancing it on a support. We are now doing this with the WFP institutional stoves in Swaziland, except the air is feeding from the back, not the side to give a true counter-flow. If you want, make the floor the height of the fuel support and using it is something like dropping wood to the floor and kicking it into the stove. No support, no shelf. The ash on your stove will now be cleaned from the left side air hole which keeps the mess away from the front of the stove. I will be interested to know the total cost of the stove once the metal gone.